“Born to be Wild,” the Palm Beach Zoo’s annual gala, lived up to its name as the sold-out event raised money to protect wildlife. Above are James Berwind, Stephen Mooney and Kevin Clark. Lucien Capehart Photography. PALM BEACH, FL – Party animals danced inside while four-legged creatures lounged in the courtyard as the Palm Beach Zoo celebrated its “Born to be Wild” dinner dance at The Breakers, raising almost $1 million for zoo. The gala was chaired by Lillian Fernandez, Karin Luter and Carol Mack. Whitney Wood Bylin and Thomas C. Quick served as event chairmen and Samantha Storkerson was the auction chair. 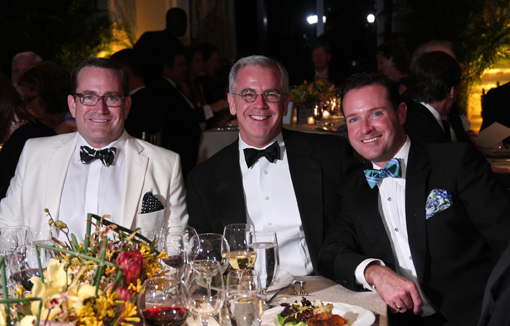 Palm Beach Zoo President Andrew Aiken reported that the party at The Breakers sold out. The nearly 500 guests had the opportunity to sidle up with the animals in the hotel courtyard during cocktails and bid on luxury items after dinner with legendary Sotheby’s auctioneer Jamie Niven making the call-outs. After the auction, revelers danced to the music of Heatwave. The program’s theme honored the arrival of the three Malayan tiger cubs born in May. Last year, the Palm Beach Zoo was one of only two institutions to successfully breed Malayan tigers. Partnering with Panthera and the Wildlife Conservation Society, through its Tigers Forever project, the Palm Beach Zoo is part of a global effort to help protect tigers and their habitat. Tigers are nearly extinct and three subspecies of tigers are already extinct. The worldwide wild tiger population has dropped from more than 100,000 in 1900 to fewer than 3,200 today. The World Wildlife Fund estimates that at the current rate of decline, tigers will be extinct within a generation. Host Committee members for the program Jan. 30, 2012, included Kane Baker, Mary Baker, Lavinia Baker, Donald Burns, Gregory Connors, Kim K. Campbell, Roberto de Guardiola, J. Pepe Fanjul, Jr., Raysa Fanjul, Tina Fanjul, James Fifield, Mary Freitas, Mark Freitas, Christie Gannon, Timothy Gannon, Rick Goldsmith, Louis Busch Hager, Jr., William Hamm, Howard Kessler, Michele Kessler, Kevin Lamb, Timothy Malloy, Talbott Maxey, Dale McNully, James Meany, Stephen Myers, William Pitt, Patricia Quick, Tiffany Reborn, John Raese, Michael Ramos, Patrick J. Rooney, Sr., Sandra Rooney, Wilbur Ross, Frances Scaife and Paul Van der Grift. Proceeds from Born To be Wild will help the zoo to advance its mission to protect wildlife and wildlife habitat, and to inspire others to value and conserve the natural world. The Palm Beach Zoo is one of the largest educational institutions in Palm Beach County, reaching more than 100,000 individuals over the past year. It houses more than 1,400 animals and is nationally accredited by the Association of Zoos and Aquariums. For more information, visit www.palmbeachzoo.org.